NOTICE: Activation key must be used on a valid Steam account. Requires internet connection. 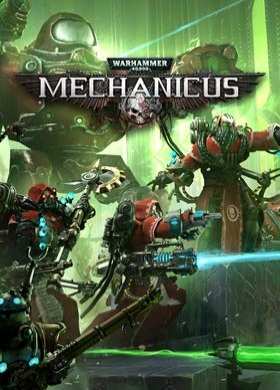 About the gameTake control of one of the most technologically advanced armies in the Imperium - The Adeptus Mechanicus. As Magos Dominus Faustinius, you’ll lead the expedition on the newly rediscovered Necron planet of Silva Tenebris. Customize your team, manage resources, discover long-forgotten tec… h, and control your Tech-Priests’ every move.Your every decision will shape the missions ahead and ultimately decide the fate of the troops under your command in over 50 hand-crafted missions. Choose your path carefully - the Imperium depends on it. Key FeaturesAugment Flesh is weak! Upgrade your Tech-Priests with weapons, support items, Servo-Skulls and other mechanical augments as you assemble your cohort. Customize your team’s disciplines, choosing from multiple character classes to create a squad for every playstyle.Unique Tactical Combat	Engage in immersively strategic combat that will test your mettle under the extreme pressure of the xenos ambush. Access your most powerful weapons and abilities by using Cognition Points and advance on your enemy without pause. Fear not, the Omnissiah favours the brave.The Library of Immersion A compelling story written by Black Library author, Ben Counter, specifically crafted to fit the unique personality of the Adeptus Mechanicus faction, with each character having their own personalities and agendas. Feel the tension and admire the devotion with unique visual effects and breathtaking audio. Difficult Decisions Make tough decisions that will forge the future from your Ark Mechanicus, The Caestus Metalican, and send you towards alternate endings for a truly unique playthrough. Be warned, however, the more you explore each tomb, the greater the rewards but also greater the threat.Canticles of the Omnissiah	Collect in-game achievements and be rewarded with strong abilities that can be used once per mission to aid you in the heat of battle.and so much more	System Requirements Windows - Minimum OS: Windows 7, Windows 8 (8.1), Windows 10, Both 64-bit and 32-bit Processor: 3GHz Quad Core Memory: 8 GB RAM Graphics: 2GB ATI Radeon HD 7970, 2GB NVIDIA GeForce GTX 770 or better Disk Space: Est. 8 GB Sound Card: DirectX compatible sound card Warhammer 40,000: Mechanicus © Copyright Games Workshop Limited 2018. Mechanicus, the Mechanicus logo, GW, Games Workshop, Space Marine, 40K, Warhammer, Warhammer 40,000, 40,000, the ‘Aquila’ Double-headed Eagle logo, and all associated logos, illustrations, images, names, creatures, races, vehicles, locations, weapons, characters, and the distinctive likeness thereof, are either ® or TM, and/or © Games Workshop Limited, variably registered around the world, and used under licence. All rights reserved to their respective owners.